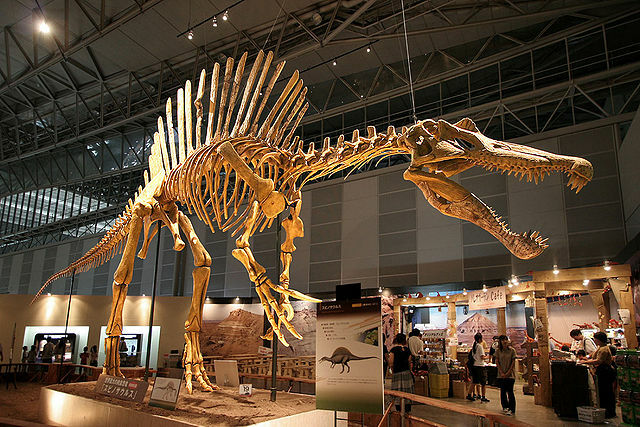 Giant dinosaur skeletons welcome visitors at most natural history museums around the world. Television documentaries show us vivid reconstructions of their behavior and interactions, and several recent movies have made them famous movie stars. Recent research studies have led us to a greater understanding about dinosaurs and have revealed interesting aspects of these giants from the past who seem to live on in people’s imaginations. However, there is still much to learn about them and in this article we will review the main questions that students and teachers often raise about these creatures. Scientists have identified nearly a thousand different genera (types) of dinosaurs, although some are represented by so few bones that some people consider their identification as questionable. There is no doubt that dinosaurs once lived on Earth and in certain places seem to have been numerous. Paleontologists have found evidence of their existence in sediments from all continents, including Antarctica and have found evidence that includes bones, eggs, nests, and footprints. Dinosaur bones, footprints and other trace fossils have been identified by the thousands, and are especially prevalent in the US, Argentina, Spain, France, Russia, China, Mongolia and North Africa. Photo 1: Tyrannosaurus rex "Sue"
Skeletons on display in museums are rarely the original findings, but are replicas. The original bones are too valuable and delicate to be exposed to the public and are usually stored in special chambers that can only be accessed by professional scientists. Furthermore, the skeletons of museums are usually an assembled combination of replica bones from various specimens, which sometimes come from distant places. 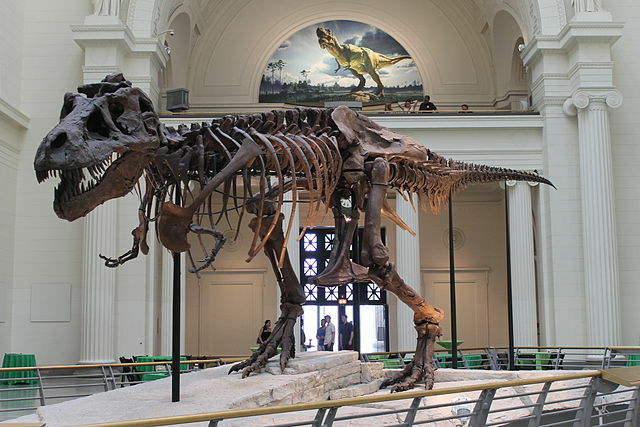 Despite this, these replicas can be considered reasonably reliable and in fact, some are complete specimens, such as the Tyrannosaurus rex "Sue" (photo 1) in the Chicago Field Museum. The animations on television, however, are much more speculative, especially as regards skin color, physiology, and behavior. The study of dinosaur bones, eggs and footprints provides valuable information about their size, physiology, social behavior, and habitat. While dinosaurs are known to be the largest land animals to have inhabited the planet, the average Diplodocus being 115 ft long (35 m) from head to tail (photo 2), not all dinosaurs were giants. 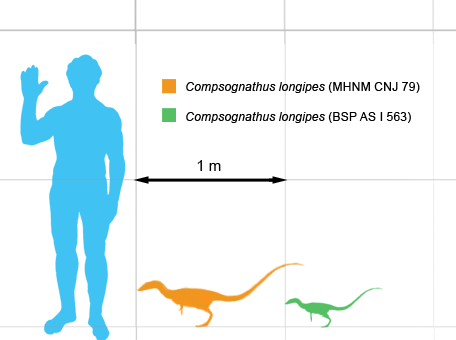 Some species were small, similar in size to a sheep or dog. 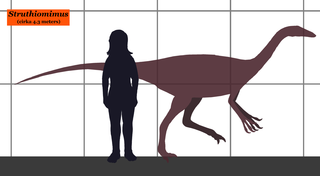 For example, Struthiomimus (photo 3) was the size of an ostrich, and Compsognathus (photo 4) was no bigger than a rooster. Often the species exhibited in museums are the largest and are usually represented in threatening postures intended to impress visitors. This has distorted the image of dinosaurs in the minds of many people. Dinosaurs appear to have been well adapted to their habitats, which spanned the globe, from rivers to forests to deserts. How do we know? The dinosaurs were buried in sediments (sand, mud), which later became sedimentary rocks. Some characteristics of these sedimentary rocks are used to identify specific environments such as beaches, rivers, swamps, lakes and arid deserts. Other fossils associated with these deposits (fossil plants, shells, microfossils, etc…) also provide valuable information on the environmental conditions. Thus, by studying the sediments in which the dinosaurs were buried, paleontologists can learn about the environments (paleoenvironments) in which they lived. We know what dinosaurs ate by studying their teeth. Most dinosaurs were herbivores while some were carnivorous and fed on small animals, fish and other dinosaurs. Size did not always determine what an animal ate. 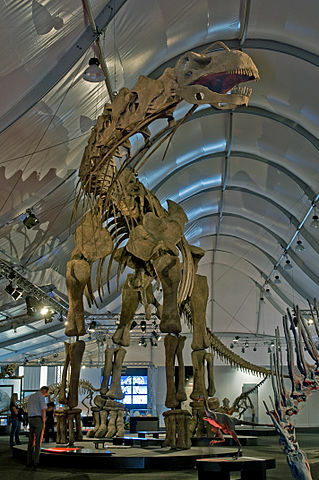 For instance, the largest known dinosaur is Argentinosaurus (photo 5), a sauropod that probably weighed 100 tons. Argentinosaurus was herbivorous, like other large sauropods. On the other hand, Spinosaurus (photo 6) and Tyrannosaurus rex, had an approximate weight of 7-8 tons each and were the largest carnivores to roam the planet. Two other sources of information about what dinosaurs ate are fossil stomach contents and coprolites (fossilized excrement). The bones and teeth of fossilized animals have been found in the stomach of some dinosaurs, which shows that these animals were part of their diet. Inside coprolites from what are thought to be Titanosaur sauropods scientists have found conifer leaves, palm leaves and, surprisingly, grass. The presence of grass is puzzling because it is assumed that these plants did not evolve until after the extinction of the dinosaurs. What was the origin of the dinosaurs? 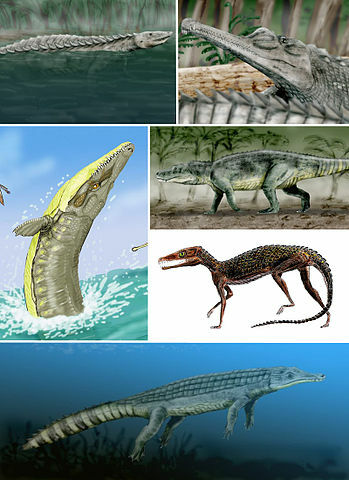 According to the theory of evolution, dinosaurs originated from ancestral animals, called archosaurs (photo 7), through a gradual process of accumulation of mutations and natural selection. Their remains in the geologic column appear in the layers of rock that paleontologists call the Mesozoic (Triassic, Jurassic and Cretaceous), which according to conventional geologic time scale, corresponds to 250 to 65 million years ago. If Darwinism were true, we should find organisms of less complexity and diversity in the early Triassic rocks, and forms of higher complexity and diversity in the Cretaceous layers. This would fit the evolutionary model of increasing complexity and diversity over time. However, the reality found in the rock record is completely different. Although dinosaurs have been studied for almost two hundred years, their origins remain uncertain. Dinosaur fossils appear suddenly, without connection to any known ancestor and disappear just as abruptly in the fossil record. If the process of macroevolution were true, we would expect to find a gradual arrival, but in fact the opposite is observed. Dinosaurs seem to appear fully formed, well adapted to their environment and highly diversified. Thus, the theory of evolution does not seem to adequately explain the origin of these animals. Creationists do not accept the evolutionary interpretation. Instead, most creation scientists suggest that dinosaurs were part of God's original creation, which later, as in the case of other animals, suffered genetic variations leading to carnivorous ways. Though there is still debate among scientists, the conventional belief is that dinosaurs died out as the result of a meteor impact and the resulting environmental disasters that it caused. Great volcanic eruptions and earthquakes are thought to have accompanied the impact, which would have been quite catastrophic. The volcanic eruptions would have blown huge amounts of gases and dust into the air. This, along with dust from the impact itself, would have blocked enough sunlight to cause a shift in global temperatures, which would have been difficult for cold-blooded animals to survive, leading to their ultimate decline.